We weave all our tartans on handlooms. These are not mechanised, so each of the 'weft' threads are placed by hand and carefully positioned to form the characteristic, symmetrical square design of traditional tartans. 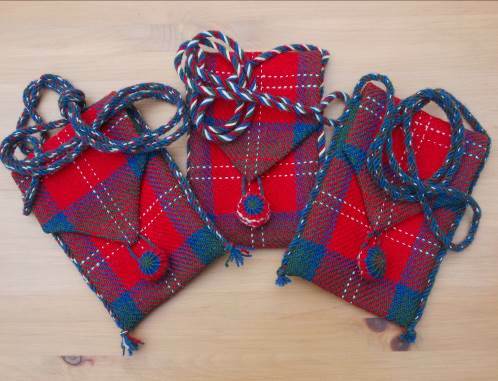 Our wraps, scarves and bags are designed using the eleven Chisholm tartan 'setts', eight of which are listed within the official Scottish Register of Tartans. We mainly weave the Dress, Hunting and Colonial designs as these are the most popular, but have woven all eleven variants. Our use of handlooms enables us to weave very small quantities of a design – therefore producing a textile to your exact requirements is much easier than it would be in the industrial weaving environment. 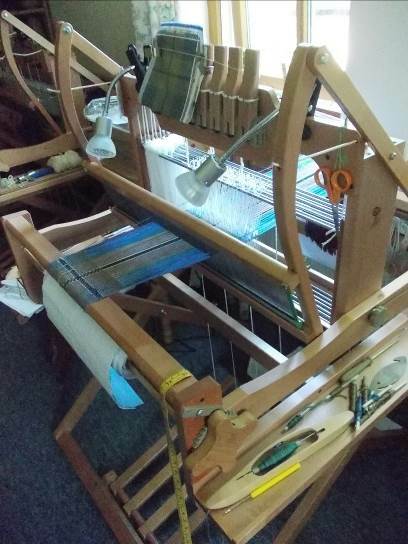 Our tartans are sold under two separate labels : Handspunweaves and Highland Handwovens. 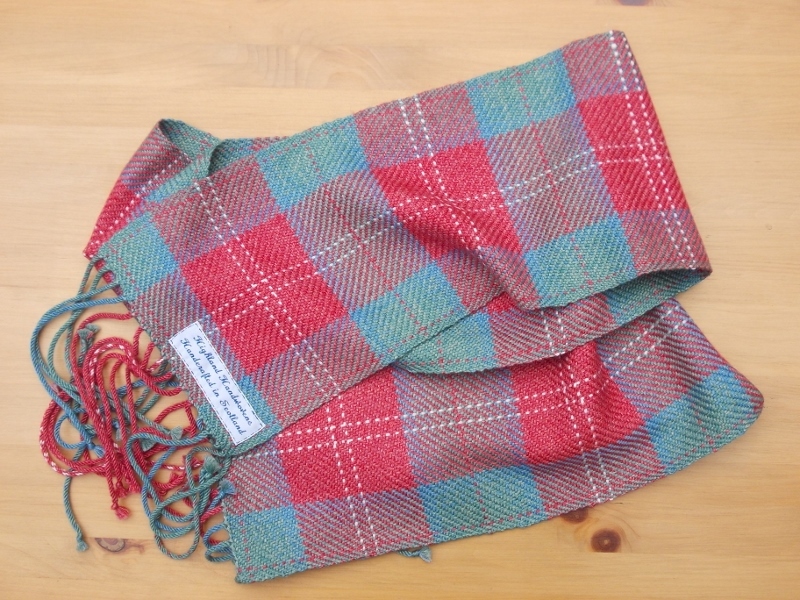 As we are also handspinners and hand-dyers, our Handspunweaves tartans are woven from our own handspun wools, such as the soft, airy Corriedale fleece we use to weave our wraps. Handspinning produces uniquely soft yarns which have not been subjected to the often harsh finishing process of industrial spinners. We then hand-dye the yarns to match our colour requirements as closely as possible. So many variants affect the take-up of dyes - the type of fibres, the ambient temperature, the water quality – that it is very difficult to precisely match colours. After dyeing the yarns are wound in the necessary colour sequence on our warping mill to form the lengthwise threads (the warp) of our handwoven fabric. The loom is then 'dressed' with these threads – and finally we are ready to start weaving the crosswise threads (the weft) with the same colour sequence. After weaving, all fabric needs to be 'finished', generally by washing and pressing, and the fringes on our scarves and wraps are handfinished. Our scarves are woven in either millspun silk, millspun 80% Merino wool/20% silk (both of which are hand-dyed) or lustrous mercerised cotton. Cotton is ideal for those allergic to wool or not wishing to wear animal fibres. 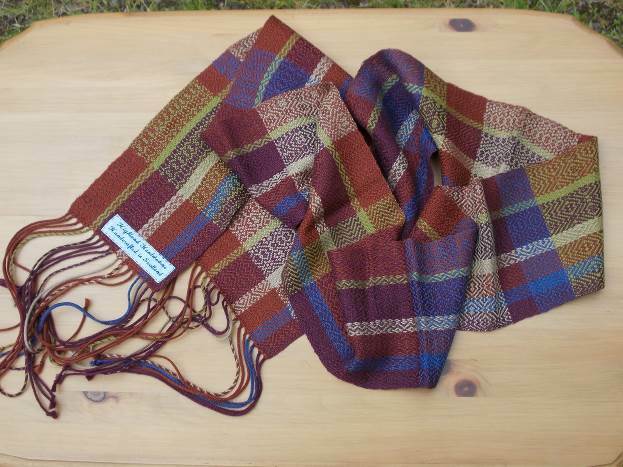 Scarves handwoven from handspun Tussah silk may be available on special order. All fibres take the dyes slightly differently – the Merino/silk fibre, for example, produces more muted colours. The woven length of the scarves is approximately 70" with an 8" handtwisted fringe and they are approximately 7" wide. Sizes vary slightly as they are handmade. 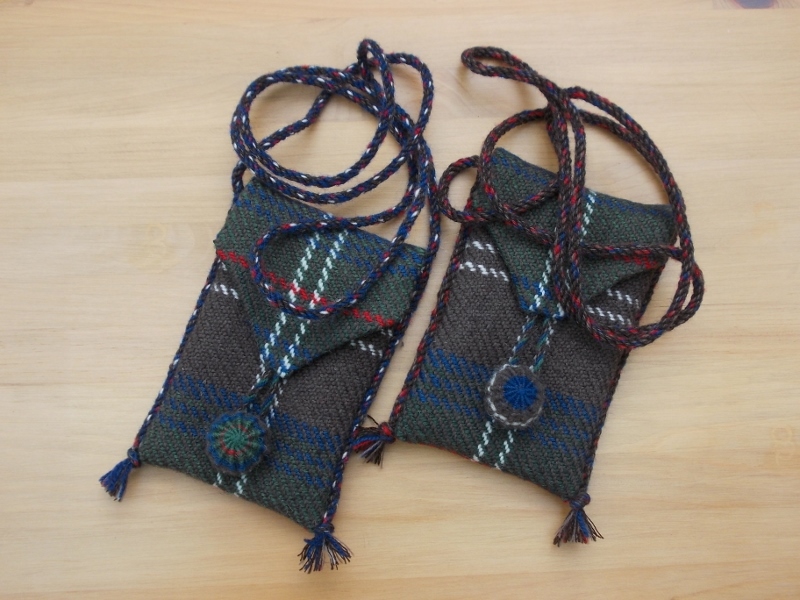 They can be woven to order in any of the registered Chisholm tartan setts in the fibres listed above, or, for something completely different, in your own preferred colourway – please contact us to discuss. Our wraps, woven in 100% soft handspun and hand-dyed Corriedale wool, are ideal for keeping cosy on cooler evenings. They measure approximately 60" woven length, with an 8" handtwisted fringe, and are approximately 21" wide. 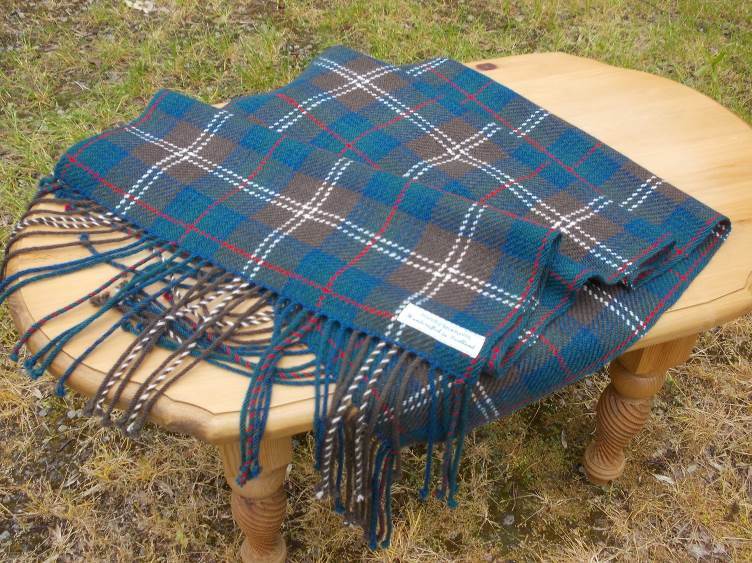 We also make a range of handsewn tartan cushion covers from handspun, hand-dyed and handwoven wool fabric. They are designed to fit a 22" square pad and some of the more unusual variations of the registered Chisholm tartan setts are currently available. 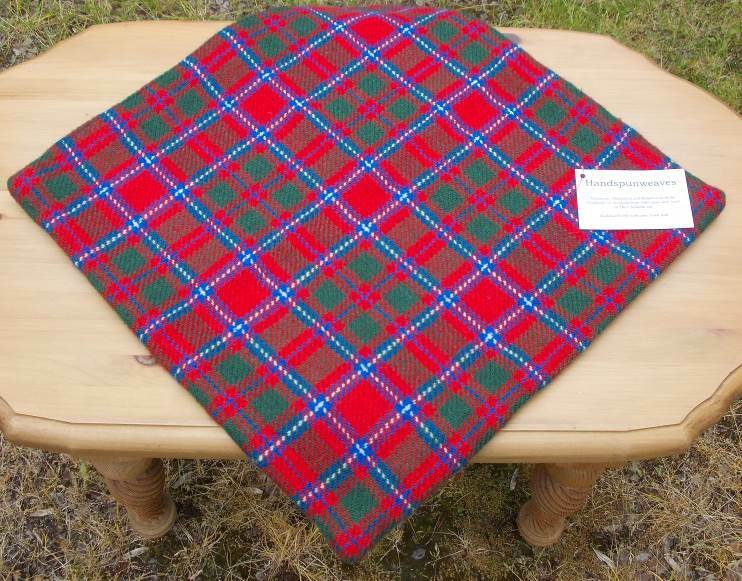 We use blended British wools, which are slightly harder wearing, for cushion covers and bags. Our handsewn bags are fully lined in co-ordinating fabric and feature handmade wool buttons and shoulder cords. As these are individually designed, no two bags are identical. The Colonial Chisholm bags are made from handwoven fabric and measure 9" x 6.5". The Dress Chisholm bags are 8" x 5". 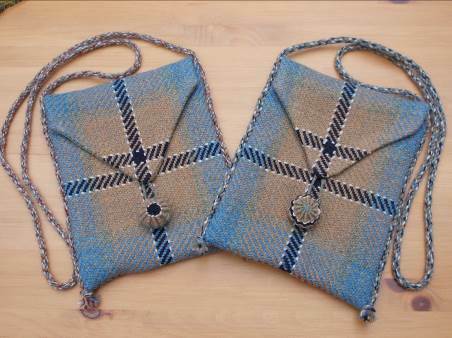 The handwoven Dress Chisholm bags are created from handspun and hand-dyed wools. We have a small range of Hunting Chisholm handsewn bags available, created from fabric handwoven from handspun and hand-dyed fibres in two sizes – 10" x 5.5" and 6" x 4". Our weaving studio at The Glen, Kindeace in Easter Ross in the Highlands of Scotland, is situated a short distance from the historic Clan lands of Glens Affric and Mullardoch, surrounded by beautiful countryside which is a constant inspiration to our handwoven designs. 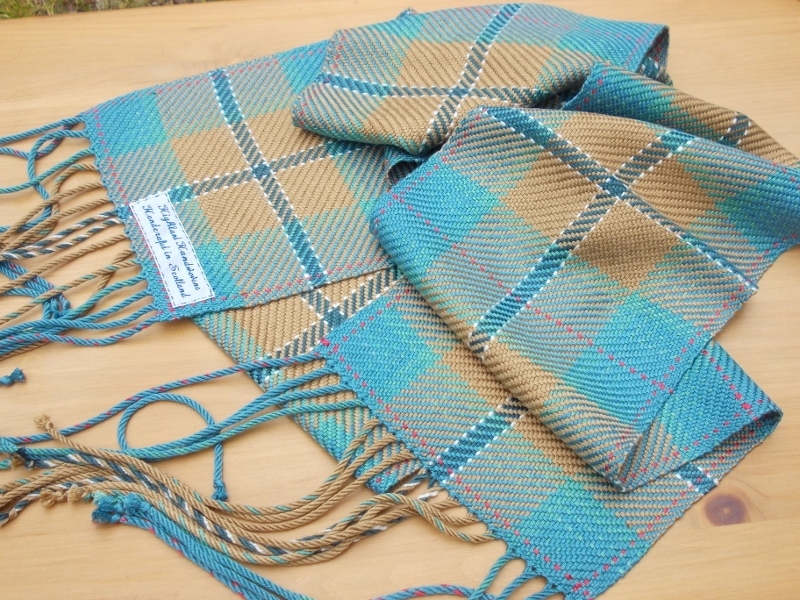 As well as Chisholm tartans, we design and handweave scarves in many colourways and fibres, and are always happy to discuss your individual requirements. Please contact Norman and Christina at chisholms.theglen@gmail.com for further details. We are happy to post worldwide at cost. 10% of all sales introduced through the Clan Chisholm Society website are donated to the UK branch.